Wondering if anyone is running a gt3 crank on their 3.2/3.4 and can detail what changes were made to accommodate the crank? I'm in touch with William Knight (great guy) but keen to hear from anyone else whose done this. Guessing most people won't change the crank isolation so difficult to gauge benefits of the crank change on its own? Talk to Henry from Supertec. I bet he has done a few, and he might have a super crank to sell you too. Happens all the time. There are a few different flavors of GT3 cranks, and dependent on stroke, there are different challenges. Especially with the latest GT3 cranks and their very long strokes, there are some clearance issues around the oil pump. Generally, you have to run custom rods and pistons, but the increased displacement is a pretty nice benefit. Thanks chaps - yes I've just read about the stroke differences between early and late cranks. The 2003 on cranks are reasonably priced, especially if I can sell on the 3.2 crank and rods. Just bear in mind that an increase in stroke will necessitate a decrease in compression height of the piston and or rod length. All easy to calculate and the results in stroke are really good compared to just making the bore larger. Hello - I thought the GT3 crank only fit in the 3.6 engine and not the 3.2. I could be wrong on this. Are there super cranks that feature increased stroke that would fin in the 3.2 case? Yes the GT3 will fit in a 3.2 and yes you could have a 3.2 stroked. Thanks - was speaking to William Knight last night, he concurred that stroke is king, and if he can source at the price he's been quoted i may consider a 4.0 crank. May require a new oil pump, definitely new rods, but with my 98mm mahles should make a healthy torque laden 3.7. 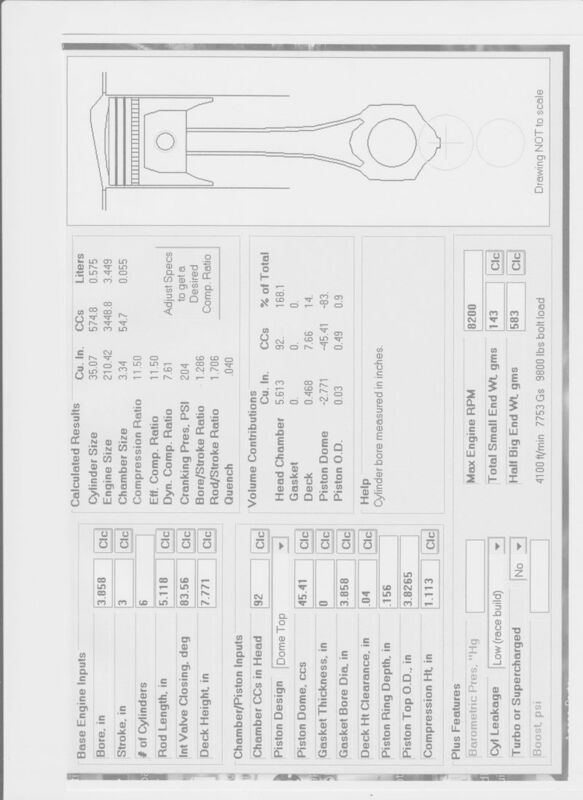 I'm not a professional engine builder but I've been searching details to build this configuration in an SC case using a GT3 crank (76.4mm stroke) and 98.0mm bore. While a slightly different starting point from a 3.2 the configuration to get the end result is fairly the same. As others pointed out the longer stroke has to be accounted for in the build to ensure proper piston deck height, clearances, and parts alignment during assembly. I have not found where anyone has documented building this engine or which dimensions to alter for the best overall results. Following what Porsche did when the 3.0L was replaced by the 3.2L they accounted for 4.0mm increase in stroke (+2mm each direction up/down) by moving the piston wrist pin higher by 1.2mm and shortening the connecting rod by 0.8mm. One possible downside was it also lowered the Rod Length to Stroke ratio (RLSR) from 1.82 (SC) to 1.71 (Carrera). Using a rod with SC dimensions could provide several benefits. 1) the big end is properly sized for the GT3 journals 2) the length 127.8mm (SC) vs 127.0mm (Carrera) helps maintain RLSR ~1.67 3) the smaller piston pin diameter 22.0mm (SC) vs 23.0mm (Carrera) could save an extra .5mm to move piston pin higher. 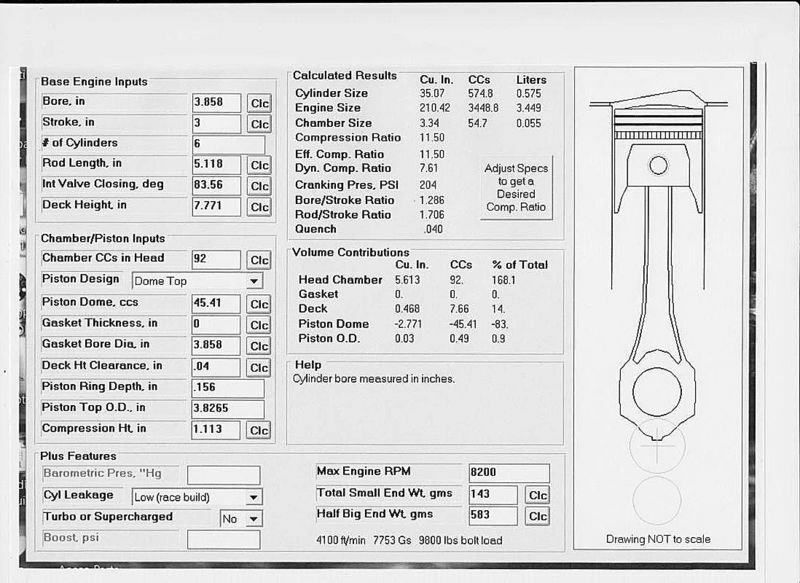 Given the 127.8mm connecting rod length, the piston pin location would need to be moved 3mm higher in comparison to stock (SC) pin location. I spoke to someone at JE and they believed it was possible with a custom piston order but I couldnt say it was definitive since I haven't requested an order. Last edited by White911SC; 05-07-2016 at 11:16 AM..
1.113" piston compression height and a 106 L/C cam. The Cam is important to keep the top center timing out of the pockets. 6. the remaining dimension is going to be piston compression height which is center line of piston pin to piston periphery. 7. give the dimension to CP contact Jerry Roche he will reassure youand he knows what to do. Just wanted to see what kind of safety factor with ARP rod bolts. Rod bolt stress for above come's out to about 126 Kpsi assuming the 9800 lbs is per bolt. ARP 2000 are supposed to be good for 220 Kpsi. I really like that you used a 130mm rod for this build. For this rod length (etc...) your build required a piston pin compression height of 1.113" (28.27mm). Did this Compression height require the wrist pin bore to be so high as it encroaches into the oil ring groove on the piston? If so, do you just use oil ring support rails and move on, and/or any concerns using the support rails on our engines? I don't believe it required any spacers and I know it did not require oil ring supports. It all hinged on the length of the particular barrels I used. The wild card is the cam I shoved a (for a Porsche) farily racey cam and it required a particular Lobe Center to clear the Valve Pockets so I knew what I wanted to run as far as a cam was concerend but waited on the Pistons and missed by a few degrees so the Intake pocket need to come down by 1mm and that put the material thickness of the Piston Dome at the bare min. The wild card is the cam I shoved a (for a Porsche) farily racey cam and it required a particular Lobe Center to clear the Valve Pockets so I knew what I wanted to run as far as a cam was concerend but waited on the Pistons and missed by a few degrees so the Intake pocket need to come down by 1mm and that put the material thickness of the Piston Dome at the bare min. You got me wondering about the attention to the cam specs...I would think the same timing/clearance issues would occur if used a similarly aggressive cam profile with a stock 3.2 Carrera crank, assuming same heads, deck height, etc. Or....you really did mean the valve timing/clearance issues become even more critical with the longer stroke of the GT3 crank? the tight compression height and the type of Forging used don't leave alot of material under the Piston valve pockets so you can't just bury the valves by fly cutting the pockets for clearance, you need to kind of know what kind of valve drop you have. This is determined by the Top timing (how far the valves are off the seat at TDC overlap at your proper timing) now you can tell the Piston guys what this is but they sometimes don't pay attention that will possibley force you to change the lift of one of the cam lobes at TDC hence the widening of the L/C angle. Wider has less lift Narrower has more. These engines aren't deadly responsive to L/C so you aren't sacraficing any performance. The only reason I mentioned it is without the change in length you can find a suitable Pistons that allready are clearnced this will be a new application and I did not want to leave you without covering this possiblity. I am sure if you mention it to the Piston guys they will at least be aware and leave you some recourse in case you have some fitment issues. Ok, makes sense now....designing custom pistons to accommodate both the longer 130mm rods and longer stroke in combination doesn't leave much extra material for clearancing deep valve pockets. Hence careful planning in cam specs. Thanks!